A short kid, with dull orange hair that is cut just at the front in a bob cut fashion and the rest laying behind his head on his neck in a messy formation. His eyes haven't been seen by others very often, even then when you do it's not pretty. Granted it's only just faded brown eyes nearly blackened but it's not that aspect that turns others away, rather it's how deep they are, as if retracting from any light source there are circles deeply imbedded into them making them seem sunken in. His skin is pale, with an off gray tone which makes this child seem almost ghostly in appearance. He carries around a practice sword called a Bokken which he had formed from shaving a branch to a specified shape. It's his prized possession for defensive attacks as it cannot cut but it can give way to eventual need for real weapons in the academy. His outfits consist of only one which he wears all the time. A green long sleeved vest and a blue long shirt with black shorts and sandals. He also has a wrap around his midsection where he holds his wooden weapon that is painted like a sword. The decorations on the outfit seem almost tribal in a sense, but really they're just thrown out clothes that are too big to fit him but he has no other choice but to use them. The last piece is his outfit is a folded face cover, usually he has it down but if he wishes to he can pull it up to his nose to cover part of his face. While it's apparent he has a twin, they do have more differences than just their separate setbacks. It's very often seen that they hold hands so that they don't go missing from each other. Heizu usually is more cautious of others and much more willing to fight than to just talk things out or have himself or his sister put down. He also has a bit of a creepy streak, never really showing his eyes but always watching. Like a fly on the wall he knows his surroundings and he is very willing to scare others away from his sister in any way possible, especially if they try to come close to be her friend. He is very jealous if that were to ever happen and thus avoids all contact with others or challenges them in a sense to best him to even dare come near her. This is both for the safety of his sister as well as others though, since a dark secret hides within her that he well knew about. That thirst for blood their father had runs in the veins she holds. With that he keeps caution to others as he wants his sister's secret remained in such a way and that no one dares to split them apart, he fears the day that were to come that terrible things will happen. With that he stays by her side always, keeping her calm and quelled while driving off the stupid oncomers. He doesn't believe in anything, beliefs are for those without hope of their own to keep going. He sees any of the sort as a weakness and a drawback more than an asset or an important statement. We start the story with his mother, She was a fairly young shinobi in fact much too young to even be considered an adult yet. It was during this time she was captured and held for ransom for her return. While her family had to add up a way to either get her back or pay the ransom she was being brutally raped by her captures. As it was found her family had no way other than to pay the ransom. As she was given back it was far to late and long into her young pregnancy. Normally she would have died but by some miracle she was alive after the birth. However her family shunned the newly born children for being bastardized. However, they were allowed to remain. Shortly after the children's birth the mother was found dead. The children were told from birth that their mother died during child birth and that their father was executed. In reality, their father, the bandit had actually killed their mother shortly after their birth. He had managed to escape before being able to kill the children as well. In the end, they were allowed to take the mother's place as Clan Royalty. 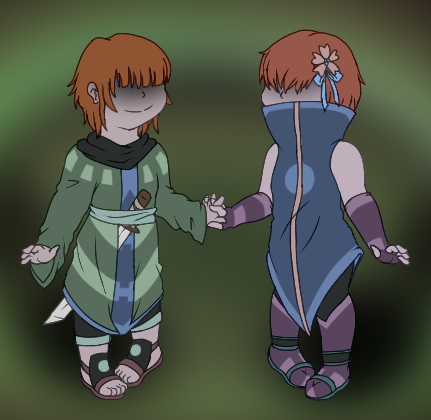 Kaiya and Heizu Uchiha, are the children of the Clan Leader's Brother's Daughter. Here they are as academy student equivalent, it's a wonder how they survived but they did, now it was time to show that they were willing to survive together.